Q Proshine® has a pleasant green apple fragrance and a highly active formula which beads extremely well, dries and enhances the vehicle’s finish. Q Proshine® can be used as a foaming clear coat protectant, a drying agent or as an additive in triple foam applications. It can also be safely applied prior to the last friction curtain without product build up to further improve the drying process. 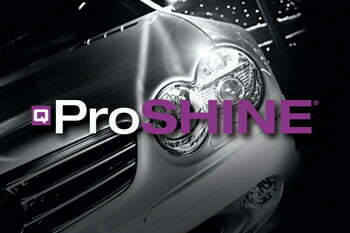 Its active formula allows premium protection and enhanced shine at an economical cost per application.